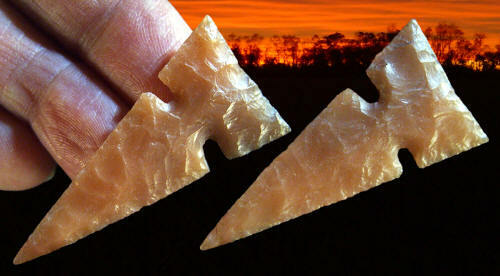 Double Notched Cahokia Gem Point. This Cahokia point was found by Perry Parker in 1939 and has been referred to by collectors as “The Perry Parker Point” ever since. It’s believed to be one of the finest examples of a double-notched Cahokia “gem” point ever found. Mr. Parker discovered it in a cultivated field just west of the main mound group on the Cahokia Mounds site. It’s described as a larger than normal thin double-notched Cahokia arrow point that exhibits exceptionally well done pressure flaking. It’s made of semi-translucent orange colored Kaolin chert and measures 1 7/8 inches (4.8 cm) long and 7/8 inch (2.2 cm) wide. Bill Fecht purchased this point many years ago from Perry Parker and kept it, along with six other Cahokia “gem” points, until his death in the 1993.